Your front teeth are quite vulnerable to dental injuries, and dentists frequently need to treat patients who have knocked out or damaged a front tooth by accident or during sporting activities. You can also lose front teeth because of infection and decay. The loss of any tooth is unpleasant, but losing a front tooth is particularly upsetting for many people because we frequently draw much of our self-esteem and self-confidence from appearance. Luckily, a front tooth implant can provide an excellent, long-term solution. When a front tooth is beyond saving, a dental implant is an option frequently suggested by experienced NYC implant dentist and periodontist, Dr. Navid Rahmani of NYC Dental Implants Center. Very briefly, a dental implant artificially restores the entire tooth, consisting of a small post or screw which is made from titanium alloy or zirconia, and which is surgically inserted into the jawbone. The implant post integrates with the jawbone during a process called osseointegration and which takes about three months to complete. Once osseointegration is finished, an abutment is attached to the post and protrudes just above the gumline. The abutment supports the implant crown. Why Choose a Dental Implant Over Other Ways to Replace a Front Tooth? Alternative choices for replacing a front tooth include a one-tooth denture or a flipper, and which is only really a temporary solution. Another option is to choose a dental bridge, and which is fitted over the teeth adjacent to the gap. These teeth must be substantially reshaped, removing a lot of their original structure so the can be crowned, and the crowns are attached to the replacement front tooth which is called a pontic. If your remaining front teeth are strong and healthy, a dental bridge is not ideal because the adjacent teeth are significantly ground down and will always need to be protected with dental crowns. Removing dental enamel from these teeth increases the possibility of infection and decay in these teeth in the future. The pontic of a dental bridge will only rest on the gums, and over time, your gum tissue and the bone underneath will gradually resorb so you could end up with an unsightly gap underneath the pontic. Unlike a dental flipper or bridge that only rests on the gums, a front tooth implant provides a solution that looks and feels like a real tooth. A front tooth implant emerges from the gums just like a natural tooth. Even the gum around the tooth is carefully shaped to provide an optimal treatment outcome. Front tooth implant looks and feels exactly like your own. Dr. Rahmani, dental implant specialist in NYC takes extensive care when designing and fabricating all implant teeth, and especially when restoring a front tooth. A dental implant helps to protect your dental health. When you lose a tooth, your remaining natural teeth will tend to drift towards the gap, destabilizing them and changing the way your teeth bite together. Additionally, tooth loss increases the stresses and strains on your remaining teeth when you bite into food. Replacing the tooth with a dental implant helps to spread this load more evenly, so your natural teeth are less likely to wear or chip because of the additional forces. One of the most important reasons for choosing a dental implant for your front tooth is for protective effect on your jawbone. A dental implant closely resembles a real tooth root, providing the alveolar bone with the stimulation needed, so bone loss doesn’t occur, ensuring your jawbone remains strong and healthy. The bone surrounding teeth, called alveolar bone, is quite fragile and can be destroyed by dental infection and begins to resorb soon after tooth loss. Bone loss affects the stability of the teeth adjacent to the gap, and it can affect aesthetics, resulting in that gap underneath a bridge pontic mentioned earlier. Initially, you will require a consultation with Dr. Rahmani so he can assess your dental health. If the tooth is still in your mouth, Dr. Rahmani will evaluate it carefully, just to make sure it cannot be saved. The next stage is for your implant treatment to be planned with state-of-the-art computer guided surgery. You will need a cone beam CT scan, providing detailed 3-D images of your teeth and jaws, allowing Dr. Rahmani to preplan your implant surgery and to create your custom treatment plan. The treatment plan is transferred to a surgical stent or guide which is a type of specialized template used during surgery. It ensures the implant is placed at exactly the precise position, depth and angulation determined in your treatment plan. Preplanning your surgery helps to eliminate errors while ensuring you receive an implant tooth that looks and feels fabulous, and which is fully functional. If you need a tooth removing, Dr. Rahmani can almost certainly do this at the same time as fitting a dental implant. He will use a removal technique called an atraumatic tooth extraction which minimizes damage to the alveolar bone. It’s also sometimes possible to place a small amount of bone grafting material at the same time as a dental implant, rather than to place it during a separate surgery. Because treatment is preplanned, the actual surgery for placing a front tooth implant is very quick, and you may only require local anesthetic, but if you feel nervous then ask about sedation dentistry which will ensure you feel completely comfortable and relaxed during the short procedure. Afterward, you will be given full instructions on how to care for the implant site as it heals. You will receive a temporary tooth on the same day. The tooth is mostly for aesthetic purposes only, and you should avoid biting on the tooth while it heals. It’s likely to be constructed in such a way to ensure it doesn’t contact your opposing teeth. Once healing is complete, your new permanent tooth is made and fitted, completing your treatment and leaving you to enjoy your newly rejuvenated smile. Periodontal Services We are dental implant specialists and are periodontists in NYC. We treat diseases and conditions that affect gums including periodontal disease, advanced gum disease or periodontitis, periodontal pockets, we treat oral inflammations. We maintain a separate dedicated website specifically for gum disease related information, and our periodontal services for patients in Midtown Manhattan & Upper East Side, NYC. Our NYC Dental Implants Center only uses best quality dental implants from Straumann (Basel, Switzerland). It’s the largest and most advanced dental implant company in the world. Dr. Navid Rahmani is an internationally recognized, Board Certified Periodontist and best in class dental implant specialist. All dental implant procedures are performed in our Midtown Manhattan dental center. You will find that Dr Rahmani takes a great deal of care in ensuring dental implant surgery is as comfortable as possible. The area will be numbed using local anesthetic and additional sedation can be used if required. During implant surgery it is necessary to drill into the jawbone but this process is pain-free as bone has no nerve. Normally, the most uncomfortable part of dental implants treatment is likely to be when the gum tissue is cut in order to expose the underlying bone. The use of computer guided surgery means incisions are kept to an absolute minimum as the pre-made stent allows for precise and faster treatment. Using advanced laser dentistry helps reduce this discomfort even further, minimizing or eliminating bleeding as the laser energy automatically seals any blood vessels. Laser dentistry is extremely accurate and afterwards there is less swelling and recovery is faster. Afterwards, any discomfort should be easily controlled with over-the-counter painkillers such as ibuprofen which will help reduce any swelling. Often people are surprised to find they have no discomfort at all and anyone wishing to have a single dental implant will be perfectly fine to go back to work next day. A tooth extraction may prove more uncomfortable than dental implant surgery in NYC. Teaching at New York Hospital Queens, Dental and Oral Medicine-Department of Prosthodontics. The information on this website is to provide general dental implants information. In no way does any of the information provided reflect a definitive dental advice. It is important to consult a best in class dental implants specialist in NYC regarding ANY soft tissue defects or biomechanical failures as it may be a sign of a serious periodontal condition. A thorough dental implant evaluation should ALWAYS be performed for an accurate diagnosis and dental implant placement plan. Be sure to call a dental implants NYC specialist or call our office in Midtown NYC to schedule a consultation. Our site is the source of information about the dental implants related conditions and procedures. 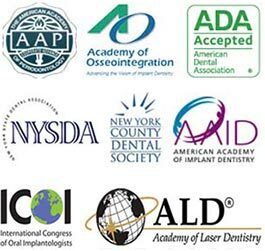 This information is intended for patients looking to learn about our practice and to make an appointment to see a dental implant specialist in New York. Content can not be copied, reproduced without prior written permission.